What is Toxic to Cats: What to avoid? Toxic to Cats: What to avoid? Major dangers include food that is poisonous to cats and can thus harm the health of the four-legged friends. Therefore, we inform you comprehensively which foods are poisonous for cats. So, what is toxic to cats? Avocados contain dangerous Persin. This toxin can cause gastrointestinal discomfort. Due to their high fat content avocados can cause inflammation of the pancreas. The fruit cores of the avocado also contain hydrogen cyanide, which is toxic to dogs. That's why avocados have not lost anything on the diet of four-legged friends. Alcohol contains harmful substances that can also cause severe discomfort. The ethanol contained in it even in small quantities carries the risk of alcohol poisoning. In cats, this can lead to impaired coordination (ataxia), stomach problems and damage to the liver. Hidden alcohol in chocolates or sweet liquors such as eggnog is a particular danger. The theobromine contained in the chocolate of the pralines additionally enhances the toxic effect of the ethanol. Some cleaning products are completely open, such as the detergent in the kitchen or the soap in the bathroom. Your cat will be sure to take a look at the apartment and, depending on the scent, find it good or bad. Pay attention to how your animal reacts to it and keep the cleaning agent in a closed cabinet if in doubt, because cleaning products are always poisonous for cats. Chocolate is very popular with us two-legged. Due to its high sugar content, it is not very healthy for us. But it is simply dangerous for cats. Like tea and coffee, chocolate contains the substance theobromine. This is a chemical compound that is toxic to cats. It can cause discomfort such as vomiting, diarrhea, restlessness, panting, increased breathing, muscle tremors and cramps even in small amounts. A particularly high amount of theobromine is contained in dark chocolate and cocoa powder. Therefore, you should never give your cat any chocolate or sweets to eat. Coffee and tea are regarded as stimulants for humans and under no circumstances are on the diet of cats. In quadrupeds, they can lead to symptoms such as palpitations, muscle tremors, vomiting, diarrhea, tremors or cramps. These stimulants include caffeine, theophylline and theobromine - substances that are highly toxic to cats. 100 milliliters of coffee have between 60 and 100 milligrams of caffeine. The caffeine content in black tea is about half. From a dose of 80 milligrams per kilogram of body weight, caffeine can be deadly to cats. In addition, coffee and black tea contain the substance Theobromine, which is also contained in chocolate (cocoa). Even theobromine can lead to poisoning in cats even in small amounts. Garlic is also highly toxic to cats because it contains harmful substances such as N-propyl disulfide and allyl propyl sulfide. Consuming garlic can cause severe symptoms of poisoning. As the stomach lining becomes very irritated, it can cause discomfort such as diarrhea and vomiting. Sometimes garlic is recommended for parasite prophylaxis - this is scientifically unfounded and very controversial. Therefore, you should under no circumstances feed your cat garlic. Grapes and raisins in cats can lead to increased calcium levels and even kidney failure. Other symptoms include diarrhea and vomiting. For this reason, grapes and raisins are highly toxic to cats. In addition to onions and garlic, any onion and leeks are dangerous for cats. These plants include wild garlic, shallots and chives. Above all, chives are often found as a plant in the kitchen or on the balcony. As interesting as this plant may be for cats, it must not be consumed by it under any circumstances, otherwise poisoning symptoms may occur. Cow's milk and dairy products are not always toxic to cats. However, they contain milk sugar (lactose) and are therefore not well tolerated by adult cats. In order to metabolize lactose in the small intestine, the enzyme lactase is needed, which, however, cats do not possess by nature. In the case of insufficient degradation of the lactose, it enters the large intestine and is fermented there. The consequence can be indigestion and can represent damage to the intestinal flora. It goes without saying that drugs for humans should never be fed on animals. So it can have fatal consequences to give his animal in self-therapy painkillers from human medicine (for example, acetaminophen). To react cats very sensitive and can develop severe symptoms of intoxication. Onions are highly toxic to cats, whether cooked, raw, dried or powdered. They contain dangerous sulfur compounds that attack the red blood cells of the animals. Thus, the consumption of onions in cats can lead to vomiting, diarrhea or mucosal irritation to anemia (anemia). The blood picture can already change by a repeated intake of smaller quantities. Raw pork is by no means on the diet of cats. By eating this food, cats can become infected with the harmful Aujeszky virus. This can lead to incurable brain or spinal cord inflammation of the animals. In addition, raw pork may be contaminated by, for example, trichinae, tapeworms, salmonella or toxoplasmosis pathogens. Therefore, eating raw pork poses great risks to cats. Raw potatoes, eggplant and tomatoes contain solanine. This toxin damages the mucous membranes of cats and can lead to diarrhea, convulsions and respiratory paralysis in quadrupeds. Raw potatoes also contain a high amount of starch, which is neither digestible for us two-legged nor for our four-legged friends. Raw beans are also toxic to cats because they contain phasin. This substance may inhibit protein biosynthesis in the small intestine and lead to gastroenteritis, colic and convulsions in cats. Also harmful to cats are salted, smoked or spicy foods as well as preserved foods. These burden the kidney metabolism of cats and therefore do not belong on their diet. Many cats are also interested in houseplants in your house or apartment. Therefore, you should pay close attention to which indoor plants you put within the reach of your four-legged friend. With the wrong selection, you can also cause damage here. Because not everything that greens and flowers is good for your cat. Plants such as lily of the valley, angel trumpet, the popular winter poinsettia in winter, and other varieties are highly toxic to cats. Chives are also poisonous, which is often placed in the kitchen and on the balcony. Therefore: Before purchasing a houseplant, find out exactly which greenhouse you are putting in your home or apartment. So you do not endanger your four-legged unnecessarily. The consumption of yeast dough can cause stomach pain in cats because it ferments in the stomach of the cat. The fermentation process also releases alcohol that is toxic to cats. Eating yeast dough can cause alcohol poisoning in cats, which can be associated with severe symptoms such as stomach problems and impaired coordination. What to do if the cat has eaten something poisonous? 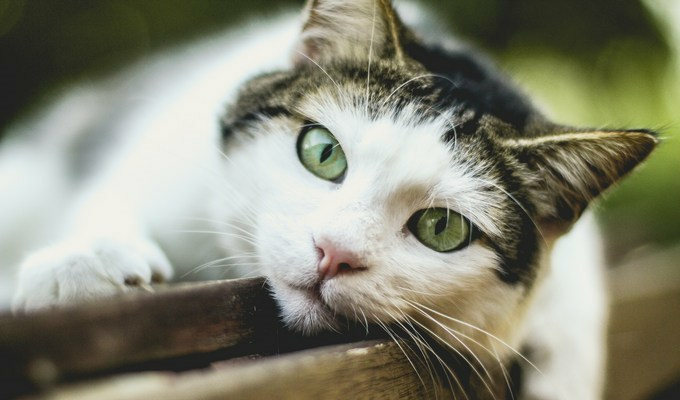 If your cat has eaten something poisonous, then you should visit a veterinary practice as soon as possible - ideally, even before the first symptoms of poisoning occur. Symptoms may include tremor, salivation and drooling, and spasmodic vomiting. Always show the veterinarian the suspected poison source (including the packaging) and bring any eaten or vomited material packed in a plastic bag. Under no circumstances should you give your cat milk, protein or vegetable oils as these are mostly contraindicated. Never try to induce vomiting independently in the animal. Your veterinarian will know what to do and start the next treatment steps. With a balanced and appropriate diet, you can support the health of your cat. Even if cats are naturally careful, you should make sure that your four-legged friend does not eat any foods that harm his well-being or are even poisonous. Therefore, onions, garlic, tuna, milk and dairy products, grapes and raisins, alcohol, coffee and tea, medicines, chewing gum and sweets, liver, yeast dough, raw pork, raw potatoes, raw beans, spicy foods and poisonous foods have lost nothing on their menu houseplants. So: caution and foresight are appropriate if you want to enjoy your cat for a long time. Because even seven lives can be short.